This 1961 photo shows technicians moving a container with experiments for irradiation. 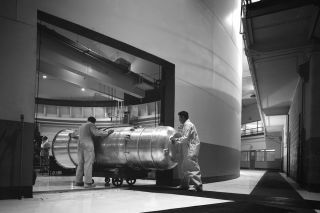 In this historical photo from the U.S. space agency, technicians wheel a large "thimble" containing experiments for irradiation into the containment vessel through the truck door in 1961. When the reactor was shut down and the protection of the containment barrier could be broken, this door was the only way large items of equipment and hardware could be taken in or out of the containment vessel, utilizing forklifts if necessary.